I'm always on the lookout for books that make it easier -- there's no easy way -- for people to explain to others what's going on when a person is told he/she has a very serious illness. Art Buchwald's 2006 memoir "Too Soon to Say Goodbye" (Random House) is an excellent example and a friend just sent me this book (more about this later in the review). The graphic novel and later feature film "American Splendor" by Cleveland OH VA worker Harvey Pekar is another good one to read and get more than a laugh or two along with sage advice. The latest book in this vein -- no pun intended, although people visiting doctors had better be aware of veins and arteries -- is Tom Brokaw's "A Lucky Life Interrupted: A Memoir of Hope" (Random House, 240 pages, $27.00). By any definition, Tom Brokaw, born in South Dakota in 1940, has led a fortunate life, with a strong, loving marriage, a wonderful family, many friends and a journalism career culminating in 22 years as the respected anchor of "NBC Nightly News." All this changed in the summer of 2013, when back pain led him to the doctors at the Mayo Clinic, his run of good luck was interrupted. He received shocking news: He had multiple myeloma, a treatable but incurable blood cancer. 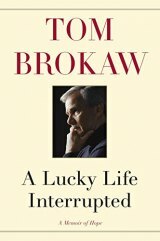 Friends had always referred to Brokaw’s “lucky star,” but as he writes in this inspiring memoir, “Turns out that star has a dimmer switch.” Another way of looking at it is capsulized in the Yiddish proverb "Man plans, God laughs." Brokaw began to keep a journal, approaching this new stage of his life in a familiar role: as a journalist, determined to learn as much as he could about his condition, to report the story, and help others facing similar battles. That journal became the basis of this wonderfully written memoir, the story of a man coming to terms with his own mortality, contemplating what means the most to him now, and reflecting on what has meant the most to him throughout his life. Brokaw also pauses to look back on some of the important moments in his career: memories of Nelson Mandela, the Dalai Lama, the fall of the Berlin Wall, the morning of September 11, 2001, in New York City, and more. Through it all, Brokaw writes in the warm, intimate, natural voice of one of America’s most beloved journalists, giving us Brokaw on Brokaw, and bringing us with him as he navigates pain, procedures, drug regimens, and physical rehabilitation. Brokaw also writes about the importance of patients taking an active role in their own treatment, and of the vital role of caretakers and coordinated care. If you're wondering -- as I am at this stage of my life -- how to explain to friends and your family what you're experiencing, "A Lucky Life Interrupted" will be of immeasurable help. We all have to craft our own stories, but Brokaw's book offers a guide. Thanks, Tom Brokaw, for a book that will offer comfort at a time when many of us need it most. And thanks, Joe Honick, for sending me Buchwald's memoir! Tom Brokaw is the author of six bestsellers: The Greatest Generation, The Greatest Generation Speaks, An Album of Memories, Boom!, The Time of Our Lives, and A Long Way from Home. A native of South Dakota, he graduated from the University of South Dakota with a degree in political science. He began his journalism career in Omaha and Atlanta before joining NBC News in 1966. Brokaw was the White House correspondent for NBC News during Watergate, and from 1976 to 1981 he anchored Today on NBC. He was the sole anchor and managing editor of NBC Nightly News with Tom Brokaw from 1983 to 2005. He continues to report for NBC News, producing long-form documentaries and providing expertise during breaking news events. Brokaw has won every major award in broadcast journalism, including two DuPonts, three Peabody Awards, and several Emmys, including one for lifetime achievement. In 2014, he was awarded the Presidential Medal of Freedom. He lives in New York and Montana.